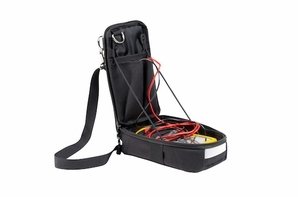 The 3M� DBI-SALA� Inspection Pouch is designed for the safe transport and use of most multi-meters, air monitors, and other portable testing devices. A unique, patent pending adjustable opening can be used to create a hands-free work station off the hip or chest. Three Tool Pockets inside the pouch are perfect for tools and testing probes. Tools can be tied off to a D-ring inside the pouch, or a D-ring located on either side of the back of the pouch. The Inspection Pouch has been designed to be worn off the belt, or over the shoulder with an included shoulder strap. Safely transfer your multi-meter, air monitor and other portable testing devices. Unique design allows pouch to be used as a work station right off the user's hip or chest. Flexible design allows user to attach to a waist belt or slung over the shoulder with the built-in strap.